Months ago, I bought the pattern for the Coraline cardigan, but had difficult finding affordable yarn. DK weight Alpaca doesn't come cheap. Ultimately I bought KnitPicks Merino Style. I swatched, washed and blocked the swatches, didn't take any notes, and then lost both swatches. Earlier this week I swatched again and determined the yarn and pattern just weren't a good match. Knit loose enough to achieve the drape I wanted, the gauge was too far off. I should have gotten some alpaca. But I had all this lovely purple yarn wanting to be a cardigan! So I search Ravelry for cardigans made with this yarn (really, what would I do without Ravelry?) and found Stefanie Japel's Puff-Sleeved Feminine Cardigan from her book Fitted Knits. I've already made 3 sweaters from this book but haven't picked it up in a while and had almost forgotten about this sweet little cardigan. It is short-sleeved too, so I may actually finish this during a time of year in which it will be appropriate to wear. I've made great headway so far, despite spending hours knitting yesterday afternoon only to spend the entire evening undoing what I had done. I do have some concerns. The gauge swatch changed after washing and blocking, but as we all know, swatches lie. Additionally, a stockinette swatch will stretch more than a sweater than is mostly stockinette but also has raglan increases. I have found through experience that raglan seams don’t stretch especially well. This is related to my other concern, which is that the shoulder and arm fit will be too tight, as happens with most patterns. I will be doing some measuring and looking at instructions for a larger size – it may be a simple adjustment. But what of Coraline? I still want to make that sweater as well, but may need to pony up for an actual Alpaca blend yarn. Since I only need so many purple cardigans, I am thinking of gray for Coraline which I believe was my original plan for that sweater. Meanwhile, it's nice to have a sweater on the needles again! 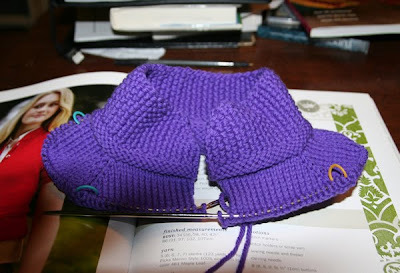 I suspect this sweater will go quickly, so if all goes according to plan I should have frequent updates.